This video is a five minute promo of the 60 min pilot show filmed in Tampa Bay - converted from the original NTSC format. "BOUNTY of the BAY" ... is a multi-faceted TV project that encompasses fishing, cooking, conservation and fund-raising in an entertainingly educational family format. Initially filmed on & around Tampa Bay in Florida, three rookie anglers are taught how to catch a target species of FISH ... then how to cook a small but choice selection of their catch for a mouth-watering DISH. 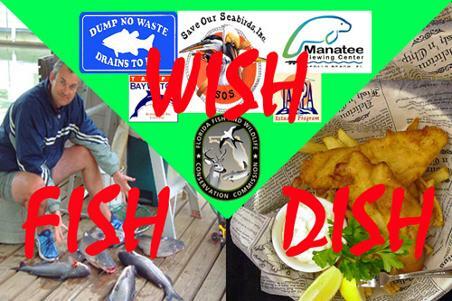 Complementing the Fish and the Dish portions comes the WISH: ... all fish caught are worth charity dollars donated to a local conservation group or project. Alongside this fun-packed, fund-raising element, the show has a serious side in reporting first-hand on key environmental, ecological and wildlife issues that affect the Bay and its users. With the kind assistance of the Florida Wildlife Commission, the show also explores outstanding locations and discovers hidden natural wonders in and around Tampa Bay & the Gulf Coast. The show's British producers are developing a UK version of "Bounty Of The Bay" to celebrate the great natural treasures & maritime resources in this country, while highlighting various local environmental concerns facing coastal communities the length and breadth of this sceptered isle. For more information, please email via our Contact Us form below. 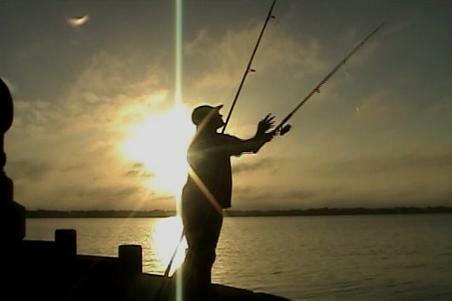 Above: Fishing in Tampa Bay at sun-rise. 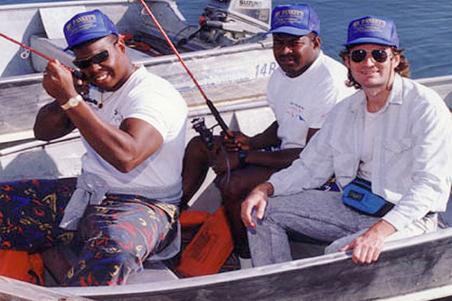 Below: Celebrity fishing with the Los Angeles Rams.